Advertising events might seem like a obvious process but here at thebestof Pembrokeshire we’ve realised that lots of people miss out the obvious steps that would help them gain more attention and engagement. Because we’re a kind bunch, we’ve come up with 6 simple steps to help you and your event get the maximum exposure! Always type out the details! Posters are great – they’re flashy and catch the eye better than text, but the problem is that Google won’t do anything with it. 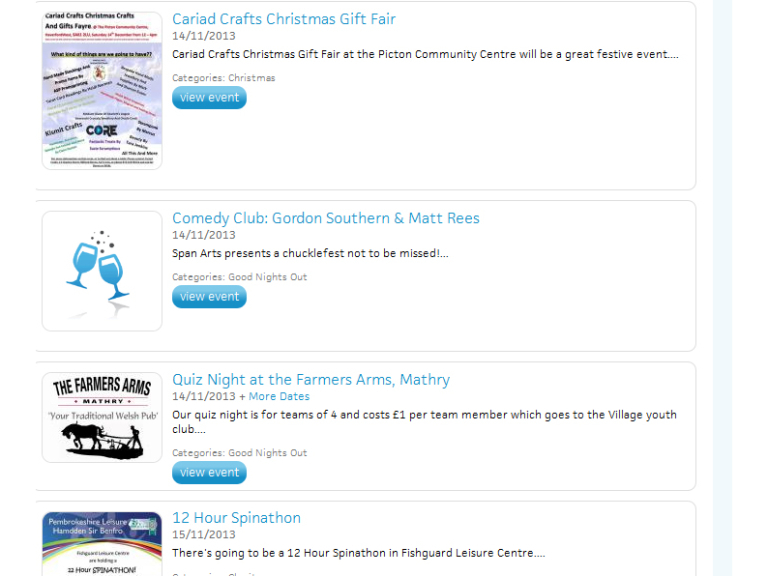 The way that search engines find content is through text, so if you just use a picture you won’t have anyone find your event through a search like “Welsh Christmas Fair”, whereas if you type out the details along with the poster with the phrase “Welsh Christmas Fair” then Google will find that and direct people to it! Advertise early! People tend to plan their schedules weeks in advance. If you have a Christmas event, start advertising it in early November! That gives people time to find the event and note the date well in advance. If I see an event scheduled for the month ahead I usually mentally book that day for that event, whereas if I see it two days beforehand I’ll probably already have other plans and disregard it. As the event gets closer you should advertise it more frequently, being careful not to spam people with it. Contact details, times and dates! It seems obvious, but so many people miss out these vital aspects of an event. A date is never enough because people won’t know if they should turn up at 11am or 9pm. They might have a specific question about their situation and will need to be able to phone and/or email you before they arrive. Don’t assume that everyone will live locally and know where the event is taking place, either – a full address including postcode is a must in a Sat Nav generation! Always include the prices! If your event isn’t free and requires payment to enter, then make them clear. Nobody likes hidden costs and nothing will annoy someone more than turning up and then being forced to take out their wallet when they weren’t expecting it. Even worse – some people might assume the price isn’t listed because it will be expensive and not bother turning up. Be smart about where you advertise it! Sticking up a poster on your local high street and sharing it on Facebook are good techniques, but try and think smart about your target audience and send the info to sites and establishments that attract those kinds of people! Of course, you can always rely on thebestof Pembrokeshire to post your event, so email us and we’ll put it up for the entire world to see! If you follow these six simple steps there’s no reason your event can’t be a success and attract a wider audience than ever before! To view the current events in Pembrokeshire, visit our Events page here. To see the businesses in our Venues and Events section, please click here.